Third large Ozonizer on order for UK water company. Enterprise Tondelli are supplying a third water ozonizer to a UK water company from their manufacturing partners in Italy specialising in this type of product. The first machine supplied in 2006 was for 30,000 litre per hour, the second in 2008 for 10,000 litres and the third machine now on order is also for 20,000 litre per hour. As they say there is no better reference than a repeat order! The systems always include a flow meter to ensure the water is not over processed in case the filler stops or the line slows down. The use of a high pressure recirculation circuit and a clever PID controller ensures accuracy of the residual ozone not achievable by in-line dosing. The benefits of ozonisation of water have long been known both as a sterilant and also a water processing aid. Ozonised water as a sterilant can be used to rinse the empty bottles only immediately before filling. Alternatively if regulations allow it can also be used in the product in which case it sanitises the product, bottles and closures as well. Furthermore it can be employed as an alternative to peracetic acid in SIP phase. Ozone can also be used to assist in removal of iron Manganese, Arsenic and Sulphides in the water. 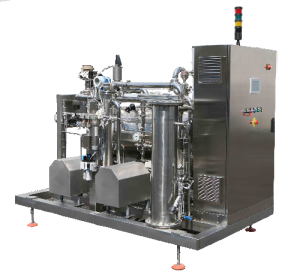 Our ozoniser also has applications in water ozone treatment systems for washing and disinfection of fruit and vegetable products, and of the related industrial processing plants. Gaseous ozone dosing systems for the disinfection of rooms and cold stores, in order to improve their sanitary conditions and to extend the shelf life of the products. Mobile units are also now available for SIP. The ozonizer units Enterprise supply are always skid mounted on a stainless steel frame and use a high pressure system which ensures better ozone absorption than the traditional systems. A very wide variety of options are now available for the units which range from 1,000 litre per hour to 50,000 litre per hour. These include such items as data loggers, ethernet connection, automatic CIP loops for the unit, etc. 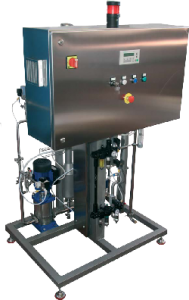 Over the years Enterprise have supplied many ozonizer units for beverage producing companies – why not ask for a quotation.